Casa Companion Homecare Solutions’ Home Care Aides offer assistance at every level of care: hourly care, daily care, live-in care, overnight care, 24/7 care and respite care. Whether you need just a little bit of extra assistance at home or complete 24-hour care, we can customize a care plan for you through one of our caring and compassionate Home Care Aides. Caregiving is rewarding, but often very difficult, for family caregivers who can also be juggling children, careers and the demands of their own lives. 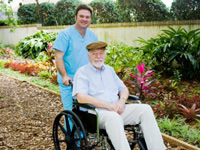 Working with a Home Care Aide offers a solution to the main concerns of caregivers. Caring for spouse, parent or loved one takes time, effort and work. You may not have the answers, know what to expect, or even how to react. The Family Learning Center includes tutorials on first aid, measuring vital signs, providing skin care, nutrition, and other important topics. Now you can have peace of mind, knowing that the information you need is just a click away. A large majority of seniors today say that they want to stay in their own homes as long as possible. There’s no need to disrupt your loved one’s life and preferred environment when all they may need is a little lifestyle assistance to stay happy, healthy and home-based. Caring for a loved one is a difficult, rewarding and all-consuming job that many caregivers take on in addition to children, marriage and career. If caregivers don’t take time to care for themselves, eventually all the people who depend on them will suffer along with them. A Casa Home Care Aide provides respite care to caregivers, temporarily filling those proverbial ‘big shoes’. 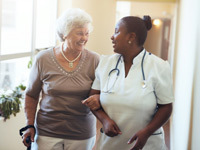 No matter the reason your loved one went to the hospital, they return home equipped with an array of instructions, medications and follow-up appointments, requiring a lot of attention to detail. Patients are leaving the hospital sooner than ever, and following the instructions is vital to future health. 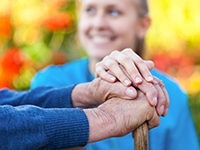 A Casa Companion Home Care Aide can help you keep recovery on track. Our caregivers can increase safety and client mobility by maintaining a fall-proofed environment, assist with standing and walking, and encouraging exercise and range of motion.